Have you ever wished that there was a way to keep your wine fresh and safe from spilling after it’s already been uncorked? 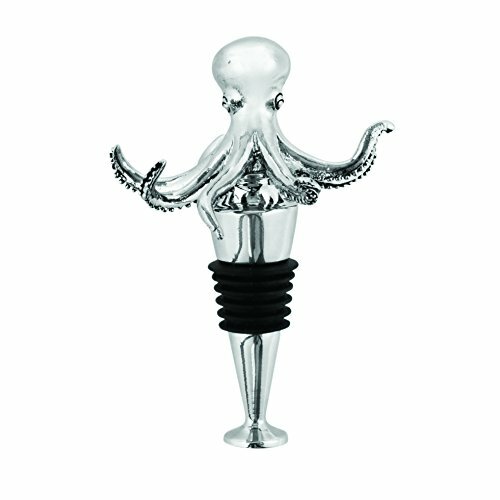 Then this octopus-themed bottle stopper is the perfect solution. These wine accessories have become popular in recent years as more and more people become wine lovers. Any level of wine drinker will be hard pressed to not find this wine stopper as charming as it is well-made. The dramatic attention to detail and zinc alloy makeup set this product apart from the rest by providing you with a wine stopper that is interesting to look at as well as practical and sturdy enough for frequent use. When it comes to wine accessories gifts, this product is hard to match in charm, even by more formal or larger wine-related merchandise on the modern market. This bottle stopper allows you to effectively deliver the essence of the ocean itself to your friend, family member or special someone, so they can preserve their much-loved favorite wine in style. The tight fit also means they’ll be able to store a bottle away properly, without worrying about leaks and spills draining the remainder of their supplies and creating a mess in their wine rack, box or other chosen storage area. Regardless of whether you’re delivering this tentacle friend as a gift or keeping it for yourself, you’ll quickly find that this is one of the greatest wine accessories out there.